I don’t usually read books set in this period of history but the idea of Lady Macbeth being more than a figment of Shakespeare’s imagination piqued my interest. I wasn’t disappointed. The human story swept me away and made a fine introduction to the carefully researched history. Blood Queen is a powerful story of passionate love and intense ambition as two factions of one family fight for their right to the crown of Scotland. 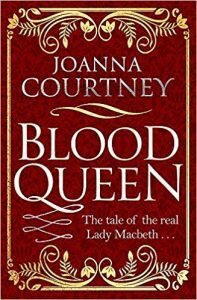 Joanna Courtney has delved deep into history to shine a light on Lady Macbeth, illuminating a very different personality from that portrayed by Shakespeare. Courtney catapults the reader into a brutal and violent world of eleventh century Scotland with a fast-paced narrative and characters that are bursting with life. Blood Queen is an enjoyable and absorbing story that kept me reading right to the end. I would like to thank little.brown for a review copy of the book. This is my honest review.